According to the National Diabetes Statistics Report, 2017 published by the National Center for Chronic Disease Prevention and Health Promotion at the Centers for Disease Control and Prevention, in 2014, 108,000 people were hospitalized for diabetes-related lower-extremity amputation. That's a rate of 5.0 per 1,000 persons with diabetes. (According to that same report from the CDC, an estimated 30.3 million Americans – about 9.4 percent of the population – had diabetes in 2015. That includes an estimated 7.2 million people who didn't have a diagnosis yet, but were believed to have the disease.) How and why diabetes can result in limb amputation is rooted in how the disease does its dirty work on nerves and blood vessels, so understanding what to watch out for – and which doctors to see for the best treatment – may help you lower your risk of developing these dangerous and common complications. Diabetes occurs when your blood glucose, or blood sugar, is too high. This happens when the pancreas is not producing the appropriate levels of a hormone called insulin that helps move glucose from the blood into cells around the body that need the sugar to function. Although all types of diabetes result from too much sugar in the blood, there are a few different kinds of diabetes. Type 2 is the most common, accounting for 90 to 95 percent of all cases in adults in the U.S. Typically diagnosed in adults, Type 2 results from a condition called insulin resistance, in which the pancreas loses its ability to produce adequate levels of insulin over time. It tends to be gradual in onset and is often found in people who are overweight or obese. It can sometimes be well managed with lifestyle changes, such as diet and exercise. Patients with Type 2 diabetes may not need to take insulin in the beginning stages of the disease, but typically will have to add it as the disease progresses. Type 1 diabetes is an autoimmune disorder in which the immune system attacks pancreatic cells, terminating production of insulin. It's often diagnosed in children and is sometimes referred to as juvenile diabetes, but it can affect people of any age. Diabetics with this form of the disease will need to take insulin right from the beginning and for the rest of their lives. Lifestyle changes, such as improving diet and increasing physical activity, can also help slow progression of the disease. Dr. Miguel Cunha, a podiatrist in private practice and founder of Gotham Footcare in New York City, explains how diabetes leads to the development of these neuropathies. "The elevated blood glucose glycates the nerves, arteries, white blood cells and the skin. That means it sugarcoats these structures," and that means pain messages that would normally tell you that something is wrong aren't able to get through that sugary coating and be transmitted appropriately. In addition to the loss of sensation in the lower extremities, many diabetics also experience vascular problems, again because high blood glucose levels disrupt blood vessel function, "so now you don't have blood flow, oxygen and nutrients going to the foot." This can slow the healing of wounds significantly, and if they don't heal adequately, they often get worse. This adds up to a double whammy for some people. Unable to feel that you've rubbed a blister, stubbed your toe or stepped on a piece of glass, the injury worsens and infection sets in. In some people, changes to the health of the foot can lead to structural changes, which can create pressure in places where it isn't supposed to be leading to sores and ulcers. If left untreated, the problem can become life-threatening in short order. Something as simple as a new pair of shoes rubbing a blister can launch "a cascade of events leading to foot sores and other foot problems that could subsequently result in amputations and in some cases become a life-threatening emergency," Cunha says. If the infection isn't treated quickly and becomes septic, that means it has spread via the bloodstream and can kill you. Amputation becomes a consideration "when the condition is no longer manageable with just infection control or wound care," Cunha says. "If the patient develops a serious infection – gangrene or necrosis of soft tissue – at that point it's no longer manageable and you need to address the condition as effectively, thoroughly and quickly as possible because it can lead to other life-altering complications." In these cases, depending on how much tissue needs to be removed, the doctor who can help you might be a podiatrist or podiatric surgeon. These foot and ankle specialists may handle toe and foot amputations below the ankle. For cases that require the removal of more tissue, such as the entire lower leg, a general surgeon or orthopaedic surgeon will likely be called on to perform the surgery. In these cases, look for a doctor who has a speciality in the treatment of diabetic patients or those who have extensive experience in the amputation of lower extremities. "Within orthopaedic surgery, there's a speciality of foot and ankle, so sometimes patients get to them," says Dr. Kathleen Wyne associate professor in endocrinology at The Ohio State University Wexner Medical Center. Cunha says that in many cases, care may involve a vascular surgeon and sometimes a neurologist, too. After surgery, you may need help with rehabilitation, so a physiatrist or physical therapist may get involved. And of course, your primary care physician and endocrinologist will also be involved all along. He says the surgery should be performed "in a hospital setting because then, all the physicians can work as a team and collaborate with each other to make sure that the procedure goes well and to ensure the patient heals appropriately. You also have to address lifestyle changes that are going to have to be made to help the patient deal with aspects of daily living physically. Psychologically, they'll be dealing with an impact, too," so a mental health care provider may also be brought in to help patients adjust to their new reality. In short, there could be several doctors and other health care providers who can help you with diabetes-related foot problems. But long before you even get to that stage, there's a lot you can do to prevent the development of diabetes-related foot problems, and mostly it comes down to being vigilant. 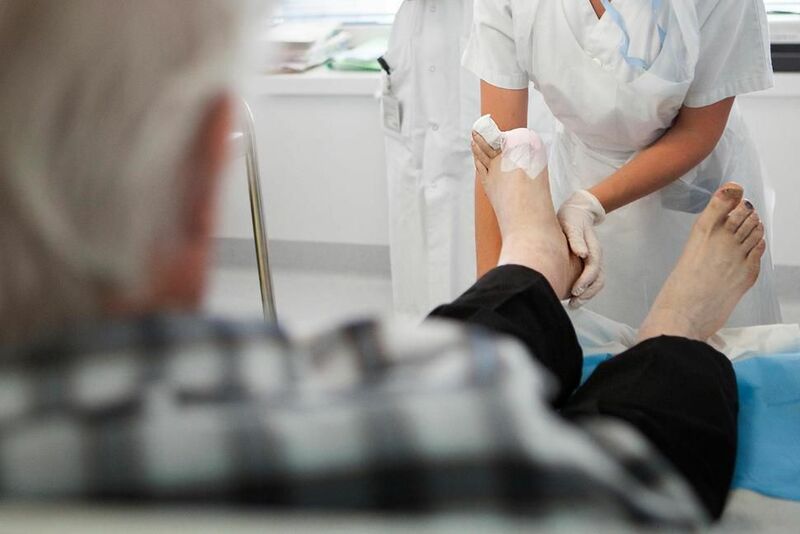 "We like to get the patient in the habit of having as many physicians as possible looking at their feet," Wyne says, and "we try to teach patients to examine their feet for themselves. Look at the bottom of your feet even if you need a mirror to see them," she says. If you spot anything that looks abnormal or that wasn't there before, get it checked out right away. Wyne says she wishes everyone knew that these complications that result in amputation are preventable. "When you talk to people about diabetes they know that you can have kidney damage and lose eyesight. We're starting to improve awareness of the risk of heart disease, but somehow people aren't as aware of the risk of amputation or they think that it only happens in people who've had badly controlled diabetes for many years." But, she says, there are some patients who first learn of their diabetes because a foot infection hasn't healed, "and we're cutting off the foot before they even understand they have diabetes." 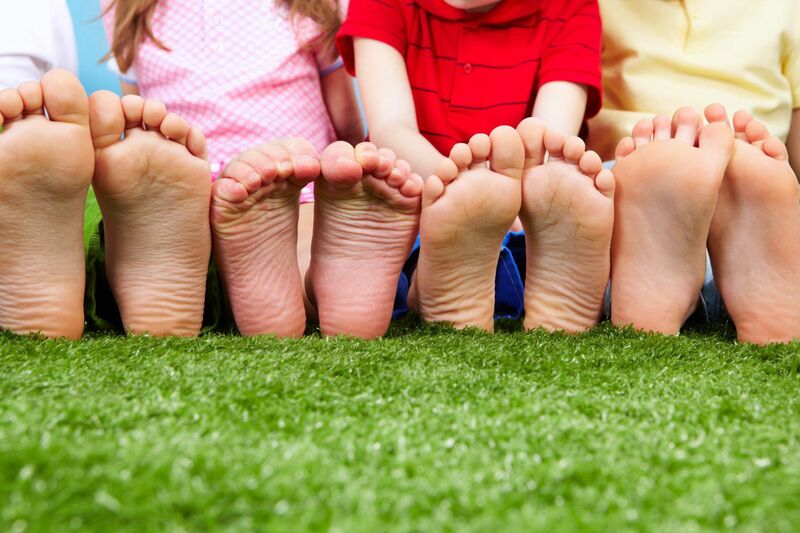 In addition to paying attention to your feet and properly caring for any blisters, wounds, red spots, abrasions, callouses or ingrown toenails when they first show up, there are some ways to reduce your risk of developing these problems. Wyne says it's important to focus on "good aggressive glucose control," as that can prevent nerve and vascular damage in the first place. Even if some damage has occurred, she says there's some evidence that "once you've developed nerve damage, intensive glucose control can slow and reverse nerve damage, but that's a lot of work." It's easier to maintain function than it is to try to restore it. "Once you've developed the nerve damage, all you can really do is work on keeping your sugars as normal as possible to prevent any further damage," she says. Follow your doctor's advice for maintaining your blood sugars and monitoring your hemoglobin A1C levels, which measure how well your blood sugars are controlled over time. Other things you can to do to prevent developing sores or ulcers is to follow "basic foot care guidelines, like not wearing flip-flops" or other footwear that doesn't provide adequate foot protection, Wyne says. Any time you're walking anywhere, even just to the bathroom at night, it's important to wear shoes that have a hard sole and toe protection. It's also important to buy shoes that fit. "You can't say, 'I'll break these in,'" Wyne says, "because getting a few blisters on your feet could lead to infection and amputation." Cunha recommends shoe shopping at the end of the day "when your feet are most swollen because that will accommodate your foot comfortably at both the beginning and the end of the day" – your foot is as big as it's going to be at the end of the day. It's also important to check your shoes every day before you put them on so you don't spend the day walking around "not realizing there's something in the shoe," such as a tiny pebble or wayward sock seam that creates friction, "and now you have a huge ulcer because you didn't feel anything." Lastly, Wyne says that quitting smoking is the biggest thing you can do to improve your vascular health and reduce the chances of developing foot-related complications. "Any kind of smoking in the context of diabetes is just the worst thing you can possibly do to your circulation. I've worked with surgeons who would require patients to stop smoking one to two years before they'd do a revascularization surgery of the legs because the blood vessels will just close back up if you're still smoking. So looking at your feet, not smoking and controlling your sugar are probably the most important things" you can do to prevent the loss of your extremities to diabetes.